Sexual harassment and violence on female journalists! evo fails AGAIN! 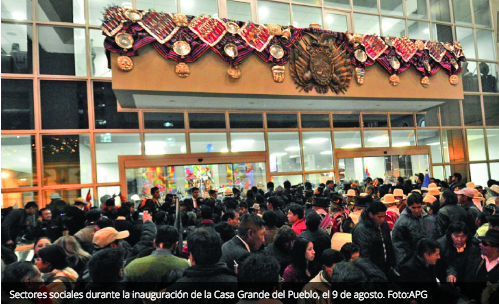 Communicators reported that they suffered sexual aggression and violence during the inauguration of Casa Grande del Pueblo. The guild of the press asks for explanations. Three organizations of the journalistic union expressed “their strongest protest” for the aggressions and sexual harassment suffered by some journalists who covered the inauguration of the so-called Casa Grande del Pueblo, on August 9. The entities demanded explanations from the relevant authorities. The National Association of Journalists of Bolivia (ANPB), the Association of Journalists of La Paz (APLP) and the Federation of Workers of the Press of La Paz issued a joint statement. “The signatory organizations demand from the Government an explanation of the discourteous and rude behavior of the presidential guard, as well as the reason for the arrogant treatment and attacks by members of social movements against journalists,” the document reads. At least four women journalists reported that they suffered violence and sexual harassment on August 9, during the opening ceremony of the new government building. Yolanda Salazar, EFE reporter, said that when she entered the new headquarters of the Executive Organ she felt that they were touching “her private parts”, which forced her to shout to stop the aggression. Journalist Nancy Vacaflor, of the Fides News Agency, also reported that she was verbally attacked by a security official. The president of the APLP, Reynaldo García, said that these facts show that “respect for women has been lost” in institutions and organizations related to the ruling party. “The statements against women, the aggressions show this and this has to be revalued,” he said. In turn, the president of the National Association of the Press, Marcelo Miralles, also repudiated the attacks. “We note with concern that the government’s speech speaks of legislative achievements in favor of women, but it is not consistent with the actions of its officials, who do not respect the law,” he said. Teams. Journalist Alexander Quispe, of ERBOL, said he saw how a Nexo journalist could not prevent his camera from breaking when he tried to enter the new Palace, due to the disorder generated by members of social sectors. Conditions. The journalist Raisa Ontiveros, of RTP, pointed out that the conditions for journalistic work, that day, “were precarious”.